[156 Pages Report] The growth of the global facial recognition market is expected to be driven by various factors, such as the increasing need for enhanced surveillance and monitoring at public places and the increasing use of facial recognition technologies in industries, such as the government. The global market is expected to grow from USD 3.37 Billion in 2016 to USD 7.76 Billion by 2022, at a Compound Annual Growth Rate (CAGR) of 13.9%. The base year considered for the study is 2016 and the forecast period is 2017–2022. The objective of the report is to define, describe, and forecast the size of the facial recognition market on the basis of components (software tools and services), technologies, use cases (emotion recognition, attendance tracking and monitoring, access control, law enforcement, and others), end-users, and regions. The report also aims at providing detailed information about the major factors influencing the growth of the market (drivers, restraints, opportunities, and challenges). 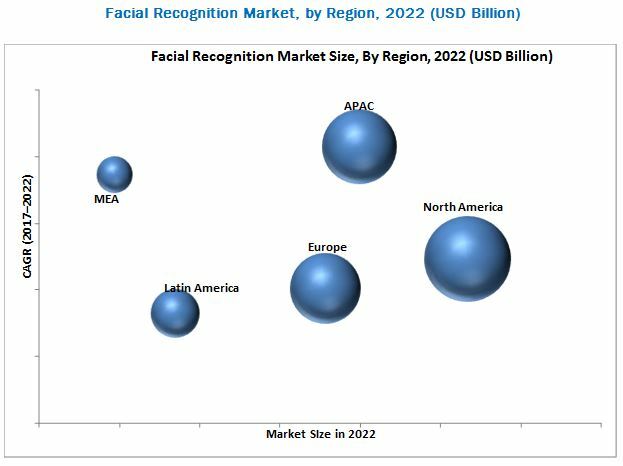 The facial recognition market includes various facial recognition vendors, such as Aware (US), NEC Corporation (Japan), Ayonix Corp. (Japan), Cognitec Systems (Germany), KeyLemon (Switzerland), nViso (Switzerland), Herta Security (Spain), Techno Brain (Kenya), Neurotechnology (Lithuania), Daon (US), Animetrics (US), 3M Company (US), IDEMIA (France), and Gemalto (Netherlands). The global facial recognition market is expected to grow from USD 4.05 Billion in 2017 to USD 7.76 Billion by 2022, at a Compound Annual Growth Rate (CAGR) of 13.9%. The growth of the global market is expected to be driven by various factors, such as the increased need for enhanced surveillance and monitoring at public places and the increase in the use of facial recognition technologies in industries, such as the government. The components segment is further segmented into software tools and services. The services segment is expected to grow at the highest CAGR during the forecast period. Due to the growing awareness among enterprises about the features of facial recognition technologies and the rising need for a more secured biometric system, the demand for facial recognition systems is expected to be increasing globally. The cloud-based facial recognition services play a vital role in face detection and recognition, and comprise training and consulting services and cloud-based facial recognition services. The facial recognition services are used by governments, Homeland Security, military, retail, and healthcare. On the basis of software tools, the 3D facial recognition technology segment is expected to have the largest market size during forecast period. The 3D facial recognition model overcomes the drawbacks of the 2D facial recognition technology. 3D facial technology is not dependent on illumination, which enables it to capture high-quality images in uncontrolled environments, such as poorly lit or completely dark areas. The 3D facial recognition technology has a high potential to analyze, identify, and verify the facial characteristics of individuals. The facial recognition technologies are used in applications areas, such as cross-border monitoring, document verification, and identity management. The services segment subsegmented into training and consulting services, and cloud-based facial recognition services. Among these services, the training and consulting services segment is expected to have the largest market share during the forecast period. In the facial recognition market, training and consulting services include feasibility assessment, analysis, and advisory of large-scale governmental and military projects. It also includes requirement gathering, biometric security design, technology evaluation, and validation of biometric features. Several leading service providers offer training and consulting services in the facial recognition market. Among technologies, the analytics solution segment is expected to grow at the highest CAGR. Facial analytics solutions are expected to be widely adopted in the coming years to secure the crowded and uncontrolled public places, and gather information about demographics and the buying patterns of consumers to boost business. On the basis of use cases, the law enforcement segment is expected to have the largest market size during the forecast period. Facial recognition software and services are predominantly applied at the premises, where the enforcement, surveillance, and monitoring of the facial detection law is needed. Facial recognition technologies are capable of recognizing faces in real-time using webcam; providing accurate gender information; detecting age, mood, and other features; and searching faces from the database. The demand for the software segment is expected to have increased, due to the increasing data breaches and growing need of enterprises to save resources from unauthorized access. On the basis of end-user vertical, the facial recognition market is segmented into government, enterprises, and other end-users. The other end-users segment includes casinos, public places, automotive, mobile application, and Homeland Security, out of which, the government end-user vertical is expected to grow at the highest CAGR during the forecast period. Facial recognition technologies are widely being implemented by this sector for creating a safe environment, with enhanced security for the public. It is said that the government sector is making huge investments in facial recognition technologies to safeguard its citizens from criminal threats. Among the 5 regions, North America is expected to have the largest market size in the facial recognition market during the forecast period. The North American region has shown increased investments in the market, and several vendors have evolved to cater to the rapidly growing market. A considerable growth is expected in the region during the forecast period. The major initiatives taken for the facial recognition technology have their origin in this region. The smart city initiatives taken by the government in this region has positively impacted the adoption trend of the facial recognition technology to enhance the monitoring and improve the surveillance. The facial recognition market faces many challenges. For instance, earlier the 2D technology was used for face recognition, where the captured images were highly dependent on the illumination conditions. The illumination conditions significantly affected the quality of the image. The other challenge was the incompatibility of integration between software tools and biometric hardware devices. The major vendors that offer facial recognition solutions across the globe are Aware (US), NEC Corporation (Japan), Ayonix Corp. (Japan), Cognitec Systems (Germany), KeyLemon (Switzerland), nViso (Switzerland), Herta Security (Spain), Techno Brain (Kenya), Neurotechnology (Lithuania), Daon (US), Animetrics (US), 3M Company (US), IDEMIA (France), and Gemalto (Netherlands). 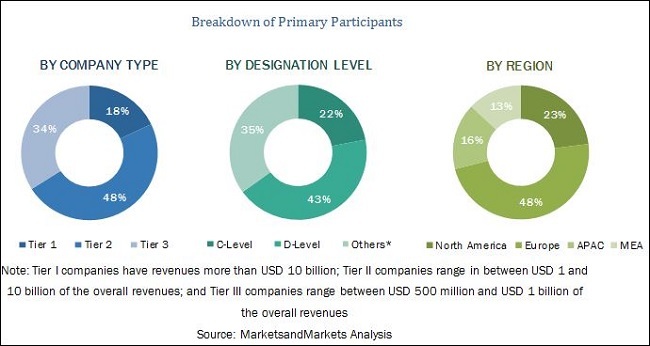 These vendors have adopted different types of organic and inorganic growth strategies, such as new product launches, partnerships and collaborations, and mergers and acquisitions, to expand their presence in the facial recognition market.